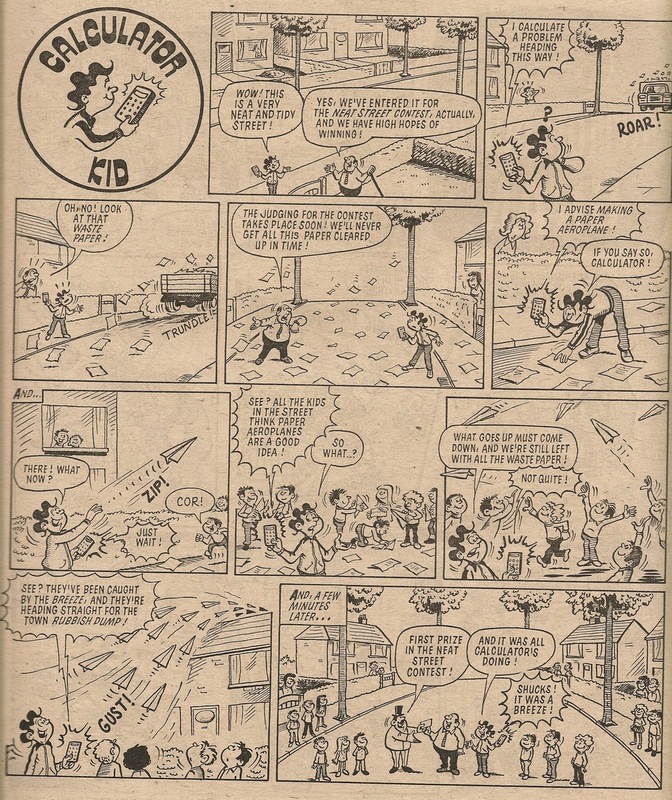 As has been documented in earlier posts in this series, the distribution of features around the early issues of Cheeky Weekly was somewhat different to that which became established as the comic settled into a routine. Thus the concluding segment of Creepy Sleepy Tale - along with its inseparable companion piece Wednesday (conclusion) - was allocated a temporary resting place on page 20 in the first 2 issues of the toothy funster's comic. The cinematic slapstick of Home Movie then moved in to the page in question, but was itself deposed a week later by the Friday element of Cheeky's Week. This initial period of volatility was then calmed somewhat by a 6 week return run of Home Movie. 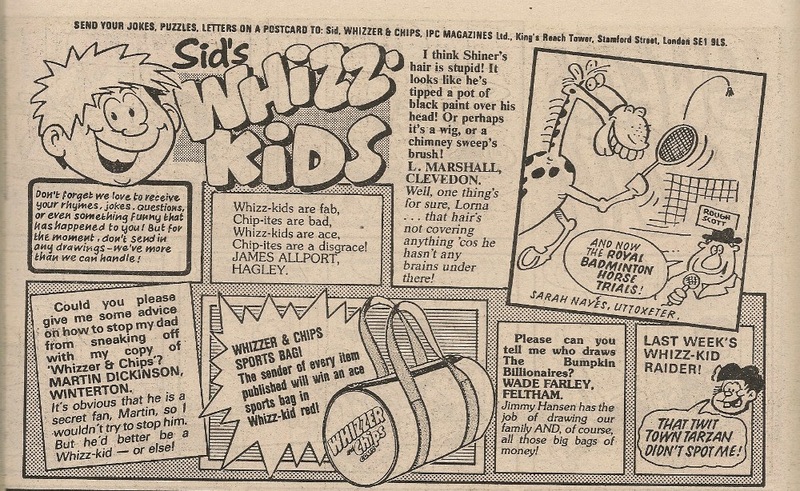 However, Friday then returned for a week, followed seven days later by a What's New Kids advertising feature page in the 07 January 1978 edition. This page may have tempted any readers with some spare Christmas money in the immediate post-festive period to lay out some cash on a Marx Toys plastic fort, Action Man books or (maybe a little less skewed towards the male readership) Thomas Salter Practical Joker kits which Cheeky was promoting. 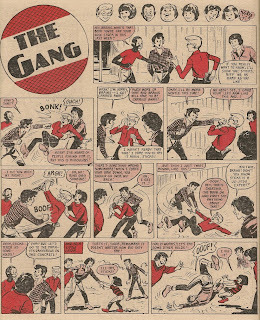 Tubby Thomson and his Home Movie pals then returned to page 20 for a 3-week run, before being interrupted by for one issue by Cheeky and his Thursday doings. Home Movie enjoyed another 3-weeks in residence on page 20 before being rudely interrupted by a double dose of animal shenanigans on page 20 in the 04 March 1978 comic – namely Bam Splat and Blooie together with fellow Buster reprintee, Cocky Doodle (who was in fact cocking, in that issue, his final Cheeky Weekly doodle). No doubt having swept the area of of any lingering evidence of poultry, Tubby Thomson and his intrepid band of cineastes resumed possession of page 20 for a further 7 weeks, during which they tackled such cinematic greats as 2001 A Space Oddity and Mary Popkins. This filmic feast was interrupted by a page depicting Cheeky's Friday in the 29 April 1978 comic, after which Home Movie resumed for a valedictory 6-week run which brought the series to a conclusion and made it, at 26 episodes, the most frequent occupant of page 20. The following week saw a skateboard competition fill the vacancy left by the departing movie moguls, while 7 days later, in the 17 June 1978 edition, the reader participation gagfest that was Joke-Box Jury shared page 20 with an ad for Twirly, the 'fantastic flying hover toy'. Manufacturer Humbrol no doubt planned on shifting as many of these plastic and balsa units as possible during the summer months. Our moneyed mate Mustapha Million was the next to occupy the subject location, but his tenure on this occasion was brief as a week later Thursday moved back in and stayed for a total of 3 weeks. Mustapha then returned for 2 further weeks, before being displaced by Charlie Counter aka Calculator Kid making his single page 20 appearance. The Friday element of Cheeky's week then fetched up for a single issue before Mustapha gained control of page 20 for 2 weeks, relinquishing his temporary resting place to Thursday for a further 2 issues. Mustapha then returned, but a big change was introduced a week later, which saw the comic undergo some dramatic reorganisation. That change was of course the incorporation of the Mystery Comic into Cheeky Weekly as of the 30 September 1978 issue, which saw a number of new strips occupy the centre pages of our favourite title. Newcomer Disaster Des staked his claim to page 20 as from that date and held his position for a run amounting to 7 weeks before he was deposed for one issue by his fellow Mystery Comic stars, the father-and-son-funsters of Why, Dad, Why? Des returned for a week but clearly his grip on page 20 had been loosened, as he gave way to Paddywack in the following issue dated 02 December 1978. No doubt you're asking why Paddywack, not a member of the Mystery Comic crew, came to rest on a page which should have been allocated to a MC strip. The answer is that the issue in question was the first of 2 editions which were truncated due to an industrial dispute, and the reduced contents were displaced as a consequence. Thus non-MC feature Joke-Box Jury found itself the surprise occupant of page 20 a week later for the same reason. There then followed 3 weeks during which Cheeky Weekly failed to be printed. 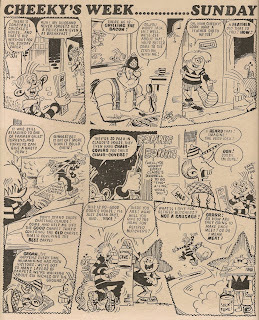 On resuming publication with a full 32-page issue dated 06 January 1979, Disaster Des was once again ensconced on the page in question, but in the following 2 issues Des was deposed by the Mystery Comic's adventure serial, Mystery Boy. Des then returned for a further run, this time amounting to 4 weeks, before being replaced for the second time by Why, Dad, Why? The disastrous one then reappeared on page 20 for just a week, and was supplanted again by Why, Dad, Why? who moved in this time for a 3-week sojourn. 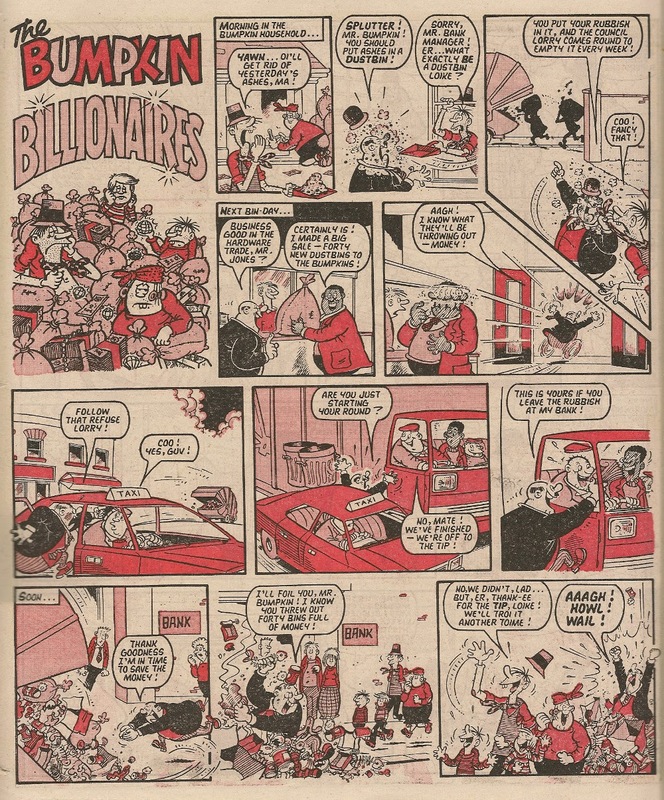 Mystery Boy then set up camp as of the 31 March 1979 issue, but remained for only 2 weeks, after which Mustapha Million resumed occupation, himself for just 2 issues. Disaster Des made his return a week later, but ceded control of page 20 to the irascible Dad and inquisitive Son antics of Why, Dad, Why? who occupied the subject location for just one week. Our plucky World War 2 amnesiac chum, Mystery Boy, then found himself on page 20 again, but was displaced the following week by Disaster Des who in turn gave way, in what seemed to be a developing cycle, to Why, Dad, Why? However, the titanic Des/Mystery Boy/Why Dad Why? 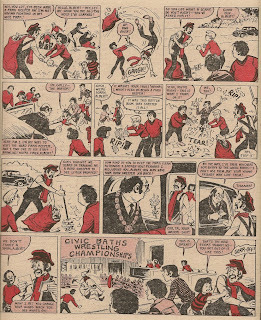 tussle over page 20 was not in evidence in the comic dated 02 June 1979 when a segment of the Cheeky Spotter Book of Town and Around came to rest in that location. Having been thusly interrupted, Des resumed occupation for three more weeks. This run ended Des' tenure on page 20, where our pariah pal became the second most tenacious strip to feature (hardly a disaster), clocking up a creditable 19 visits. 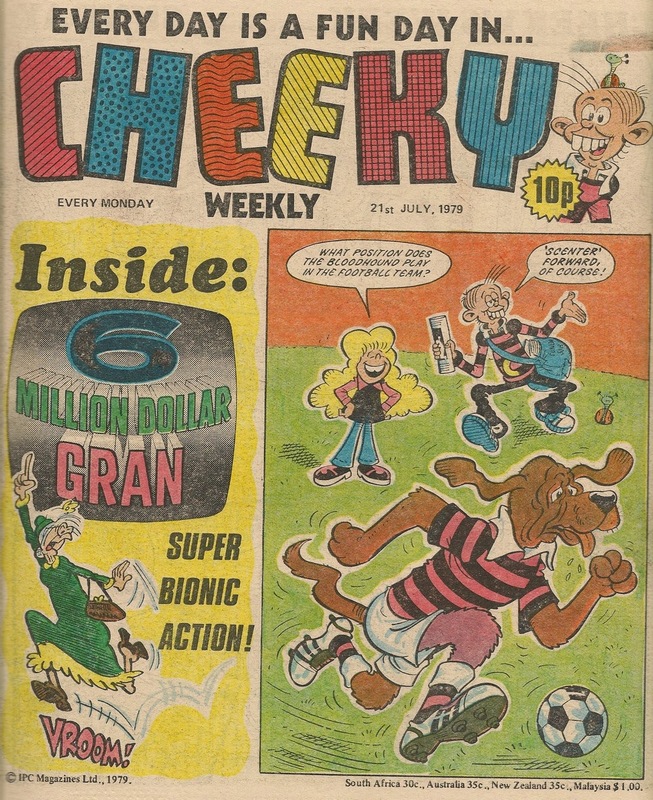 In the following issue, dated 30 June 1979, the Mystery Comic as a comic-within-a-comic made its final appearance in Cheeky Weekly and MC stars Why, Dad, Why? enjoyed their final outing on page 20. For the following 2 editions page 20 was home, as the erstwhile centre-page-hugging MC strips found themselves scattered about the comic, to our boneheaded buddy Paddywack, but there followed 3 weeks in which Mustapha Million moved in. The aspiring showbiz students of Stage School then made a 2-week bid for control, but were dislodged by a returning Mustapha. However, Mustapha's hold on the page lasted for only 2 editions after which an advert for Trebor's Double Agents broke the big-spender's grip on page 20. 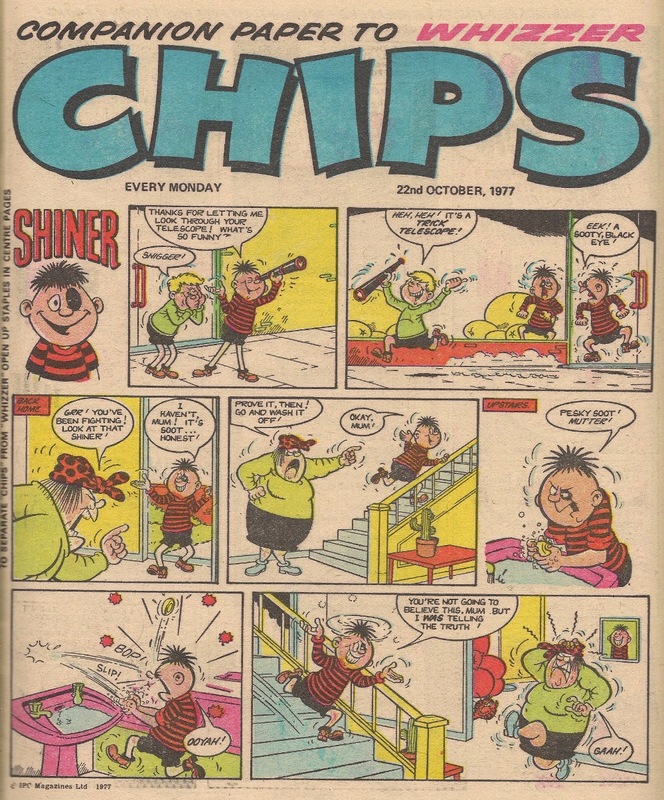 Reader participation features then monopolised page 20 for over 2 months; the Chit-Chat letters page moved in for a 6-week run before being ousted by Joke-Box Jury in the 27 October 1979 comic. A further run of Chit-Chat, this time lasting for 2 editions, ensued. As of the 10 November 1979 issue Thursday took occupancy of page 20, lodging there for the 12 weeks that remained until Cheeky Weekly ceased publication with the 02 February 1980 edition, and making Thursday the third most regular page 20 denizen (and just 1 behind Des) with a total of 18 visits. A quick look at my post on page 'churn' reveals that page 20 exhibited 52 churn events during its run, making it the 19th most-afflicted-by-churn* Cheeky Weekly location. *I must admit that I now tend to think of churn as an affliction of comic pages purely because a high incidence of churn in a particular location requires more effort when writing these 'pages' posts. However, as a reader of comics I think a certain amount of churn makes a title more interesting and keeps it fresh. The Beano of the 1970s & 80s very seldom varied the pages on which the features appeared (I think the only time things moved was when one strip came to an end and was replaced by another) which contributed to making the comic, in my opinion, extremely tedious (sorry for the heresy, Beano fans!). 18 November 1978), Cheeky - Mike Lacey. that she is a robot. Which is the most striking feature on this week's cover? 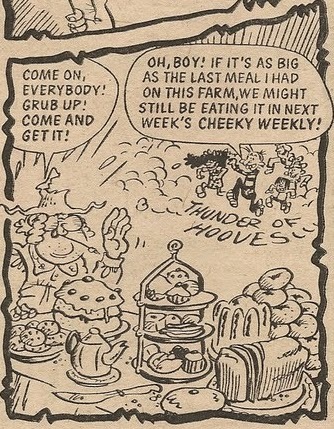 The above-title banner which makes reference to the daily nature of Cheeky's strips? The dynamic depiction of synthetic senior citizen 6 Million Dollar Gran? The canine capers in which Cheeky and Petula are engaged? Well, if your pocket money is being stretched to its last penny chew, the most significant item is the cover price which has increased by 1p to 10p as of this issue. This inflationary attack on juvenile spending power is presided over by a beaming toothy funster, who seems delighted to see the new price. However, readers should have arrived at the newsagent equipped with the requisite cash, since our grinning pal announced the impending rise in the cost of our favourite title on the final Saturday page of last week's issue. This is the second price rise for Cheeky Weekly, the first saw the cost rise from 8 to 9p just 10 months ago, as of the 16 September 1978 edition (although on that occasion the unwelcome increase was offset by the presence of a prize competition). 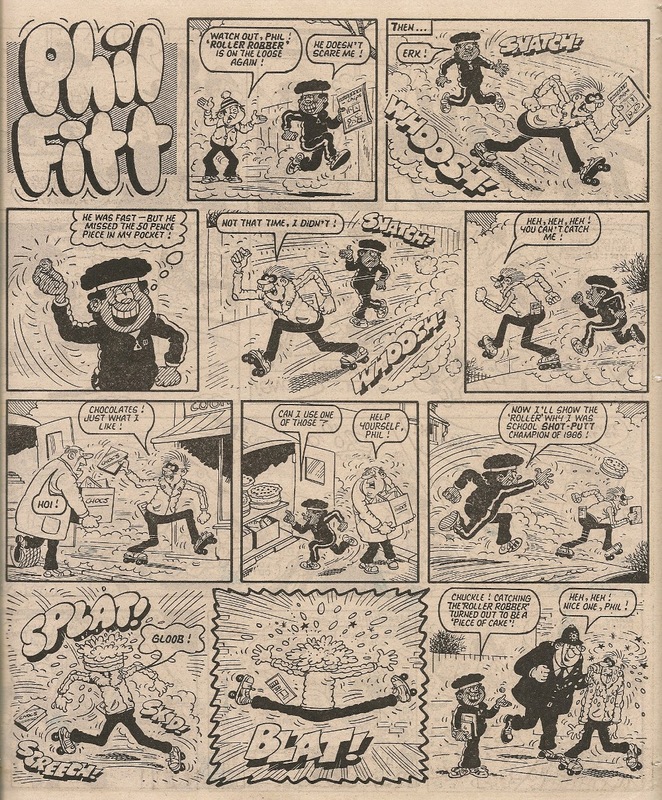 On page 2 Frank McDiarmid depicts a typically side-splitting Sunday for the toothy funster, as Cheeky indulges in banter with a selection of Krazy Town folk while negotiating his weekly paper round. Public-spirited Calc devises a plan, making use of a fortuitous fluctuation in atmospheric conditions, to clean up the streets in this weeks' Calculator Kid. 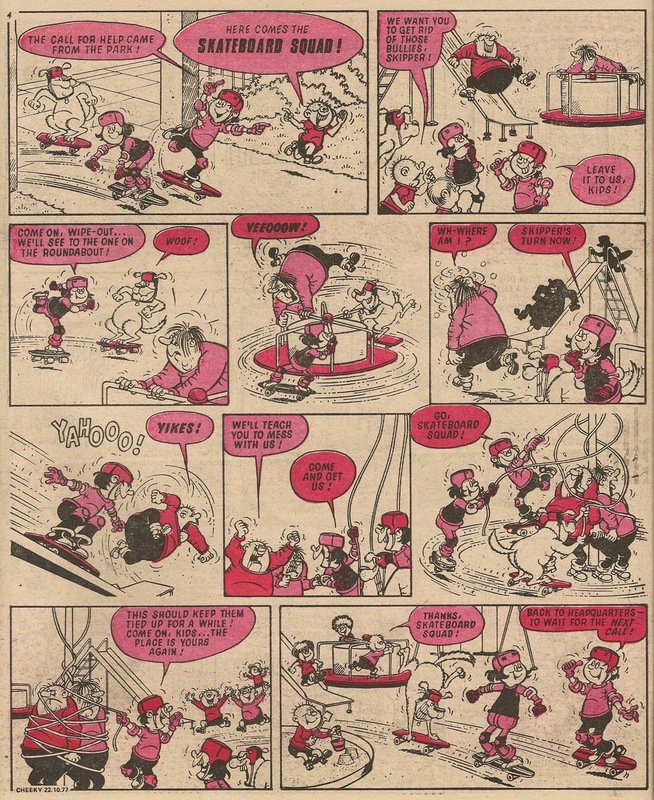 Paying a Star Guest visit to Cheeky Weekly this issue is Whizzer and Chips' wee whippersnapper, Sammy Shrink. 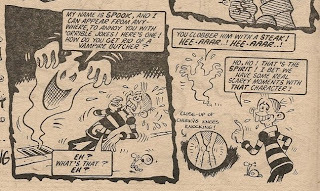 Cheeky has an eerie encounter with a new pal on Thursday; it's that funny phantasm, the ghastly gagster himself, Spook. ...following which the comic rounds off with Snail of the Century. Some characters from Cheek's Week make their final appearance in this issue - Baby Burpo's mum and dad, and Scruffbag the school cat. 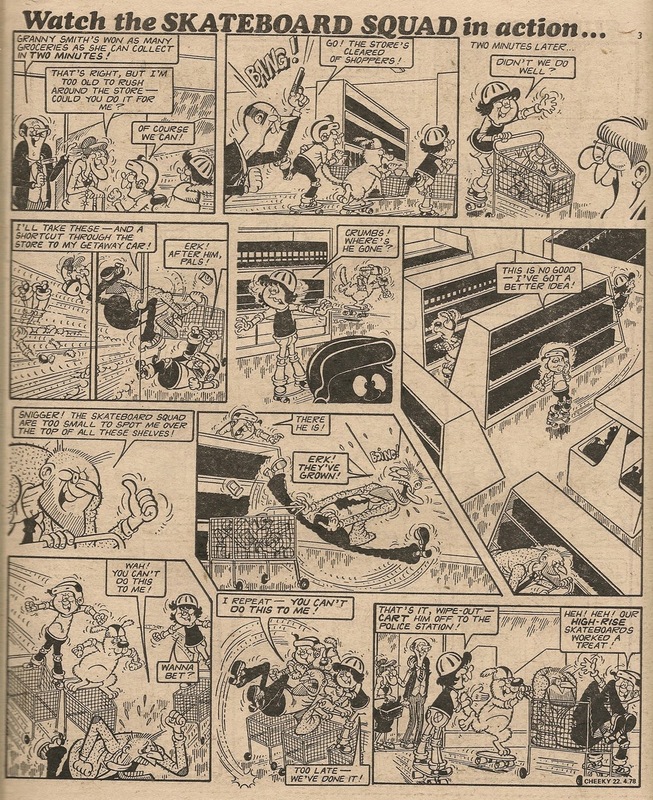 The Cheeky's Week features in this issue consist of 5 which are pure Frank McDiarmid, and 4 that are inked by another artist (or Frank McDiarmid pencils as I usually refer to such art). I spent a while searching online for any info about Jimmy Hansen, to try to get some idea of when his first IPC work appeared. There hardly seem to be any online references to Jimmy, certainly no detailed ones. He's absent from Lambiek, but there are a few mentions of him on the Buster website, although none of them give any idea of his earliest work. There is no topic about him on Wikipedia. A mention on Dez Skinn's site says Jimmy Hansen was working for IPC in (what I take to be) the early 70s, although in what capacity Jim was employed at that time is not made clear. 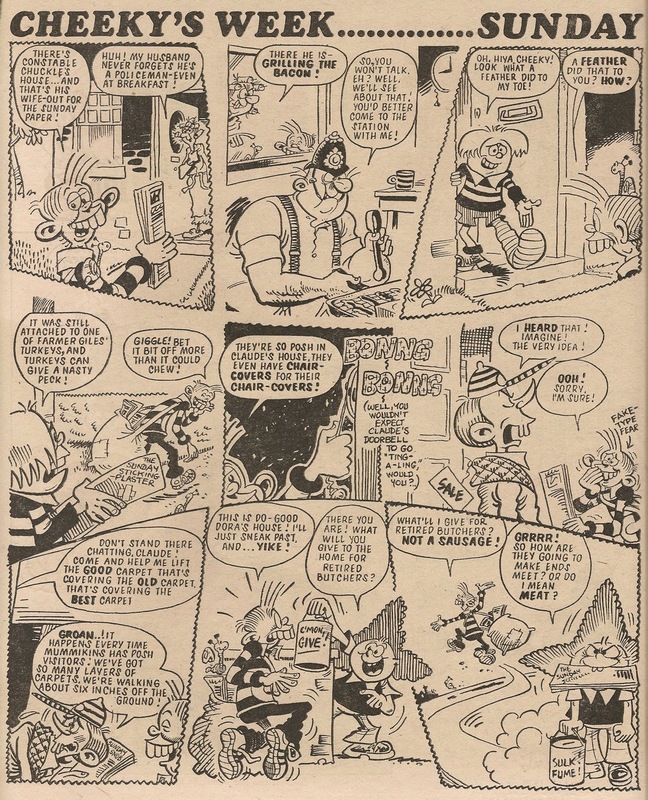 A search on the Comics UK forum returns 6 pages of posts referring to Mr H, but a lot of them pertain to his later work for DC Thomson and none that I could see mentioned the dates of his early stuff. If it's true that Jimmy's first IPC work appeared in the mid-80s, then he can't have drawn anything in Cheeky Weekly. However, the reference to Jimmy in Dez Skinn's article means there is a possibility that Hansen art began appearing in IPC titles any time from the early 70s. I've decided I'm going to leave unchanged all the artwork credits on this blog that I have assigned to Mike Lacey. Labels: Jimmy Hansen, Mike Lacey or Jimmy Hansen? 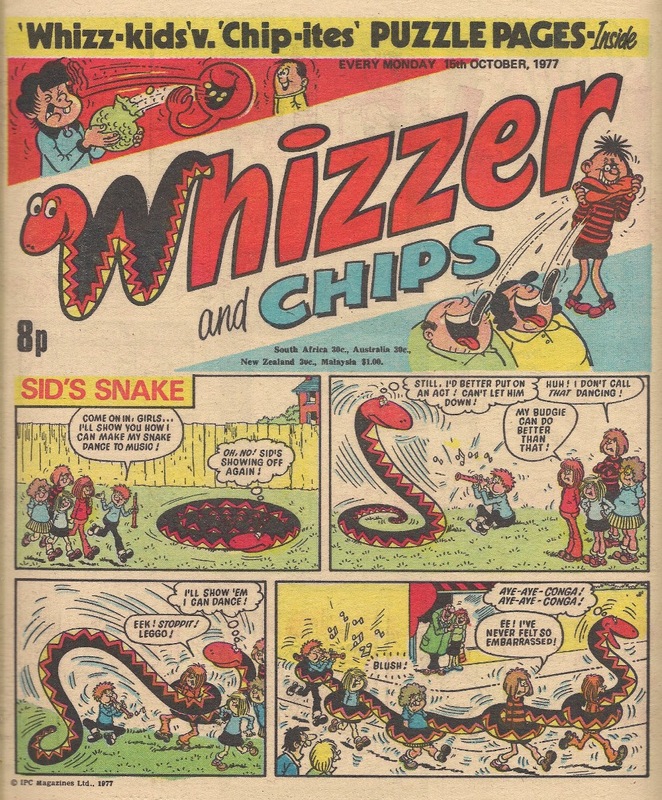 I retrieved the issue of Whizzer and Chips with the same cover date as the first Cheeky Weekly. 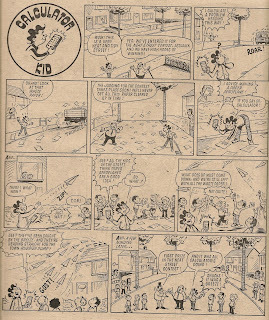 My plan is to identify (to the best of my ability) any work by Mike Lacey in that issue of W&C, then compare it with the first Skateboard Squad strip in Cheeky Weekly. I'm working on the assumption that Jimmy Hansen didn't begin providing artwork for IPC product until some years later. First up in the potential-Mike-Lacey stakes is Sid's Snake. To me this seems to be classic Mike Lacey (even though the printing quality is rather rough). The next contender is Shiner. The style is a bit different to the work on Sid (which has a kind of 'gentler', less extreme look about it, but of course there's not a lot of action in Sid's story), but assuming this was before the Jimmy Hansen era, I reckon it is Mike Lacey. The 'two parallel line legs' with little evidence of knees is a key indicator of Mike's work for me. The final strip from this issue which has the hallmarks of Mr Lacey (to my eyes, anyway) is this Pete's Pockets. The style is closer to that evident on Shiner than the Sid artwork. However, I suspect this may be a reprint from some years earlier which could account for the slight difference in rendition. The legs, although somewhat obscured by Wellingtons, certainly seem to be typical of Mike. Thus my decision is that this is by Mike. I don't know about you, but I can see a few Lacey legs in there. The style seems pretty close to that evident in Shiner above, so I'm relatively certain now that this Skateboard Squad is by Mike. Maybe I won't need to reassign the artwork credits after all. More investigations coming soon. UPDATE - I was just glancing at some covers as I put the W&Cs away when I noticed this Sid story from the previous issue to that shown above. I believe this is by Mike, but the legs are more contoured than his Shiner and Pete legs. 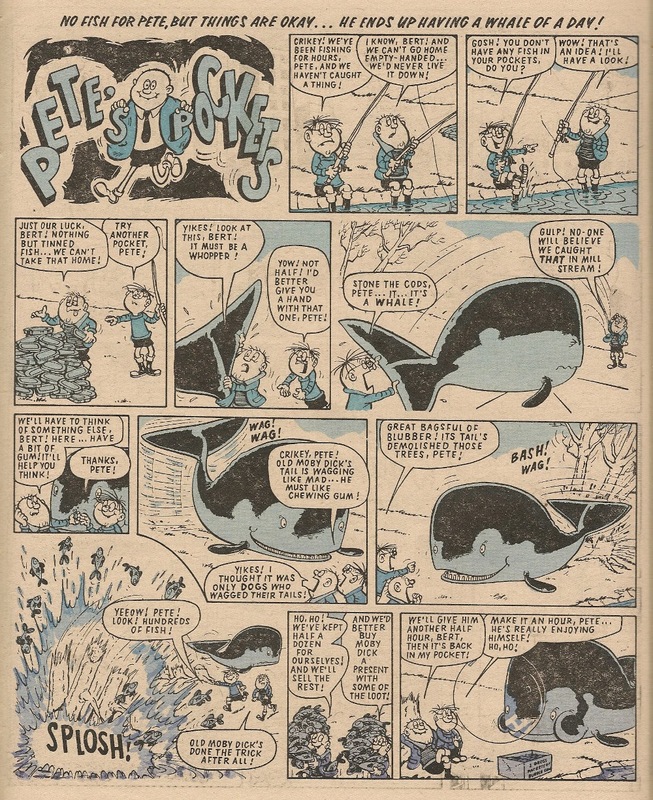 Did Mike, like Tom Paterson, concurrently use different styles of drawing for certain strips? 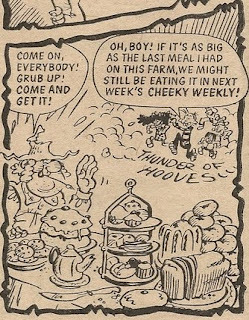 Regular readers of this blog will be aware of an ongoing series of posts in which I am documenting the 'Cheeky raids' in Whizzer and Chips. 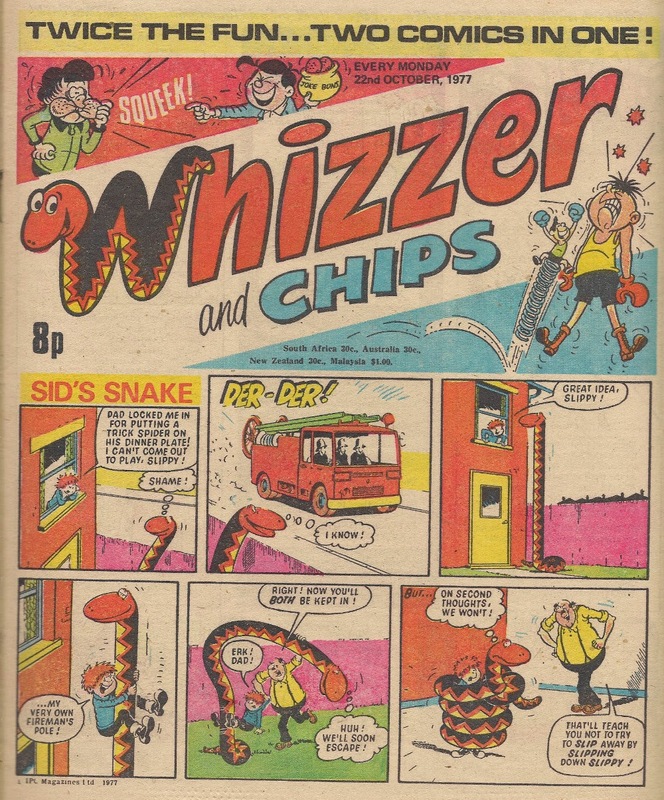 In order to research this series I embarked on, and continue, a programme of re-reading all the issues of Whizzer and Chips commencing from the Whoopee merge in March 1985. This is the first time I have looked at these issues since I bought them weekly as they were being published. This exercise has been quite instructive in ways other than relating to the Cheeky raids. I have been pleasantly surprised to find how good the comic was as it reached this late stage in its life (I'm currently up to the February 1987 issues). The old faves - Odd-Ball, Joker, Sweeny Toddler to name but three - continued giving good value, and some fun newcomers - Bottom of the Class, Memory Banks, for example - kept the mix bubbling nicely. Furthermore, some gaps in my (far from comprehensive) comic knowledge have been filled as on a number of occasions during the period in question readers wrote in to W&C asking who drew particular strips. Thus was the true identity of the first Store Wars artist revealed a few weeks back. Now I have learned something that has exposed a serious deficiency in my comics knowledge and plunged me into a bit of a crisis. Actually, this comics quandary began developing a few weeks ago when I read a W&C letters page in which a reader asked the name of the artist who drew Shiner. Now, I'd always believed that the stories of the head Chip-ite were drawn by Mike Lacey, so I was not a little surprised to read that the adventures of our black-eye-sporting buddy in fact originated from the pen of Jimmy Hansen. Jimmy's was a name that I was aware of, but for some reason had never attributed to any particular strips. My shock at learning I had mis-identified the hand behind Shiner for so many years (never mind the fact that I must have read the same letter when the comic first came out) induced a crisis of confidence in my artist-identifying skills, which I thought were pretty good in respect of IPC humour comics of the 70s and 80s. I realised I suffered an ingrained blindness as to the different styles of Messrs Lacey and Hansen and really couldn't identify one from the other. A very odd feeling. I then entered a state of denial about the whole episode. That was another of my comics certainties destroyed - I'd always believed the Bumpkins to have been by Mike. By this time it was clear I needed to re-evaluate any references to Mike Lacey on this blog. Using just one strip from each artist to identify their differences is difficult of course, but I have been studying multiple examples over the last couple of weeks and I think I'm now beginning to see the differences. It's hard to generalise about the divergences in their style, but I would say Jimmy's work goes more into extremes of action and facial expression (sometimes bordering on the grotesque), whereas Mike's work is a little more reserved. I have now begun to re-evaluate the Cheeky Weekly work that I have heretofore attributed to Mike Lacey. I began by looking at Skateboard Squad and its successor Speed Squad. 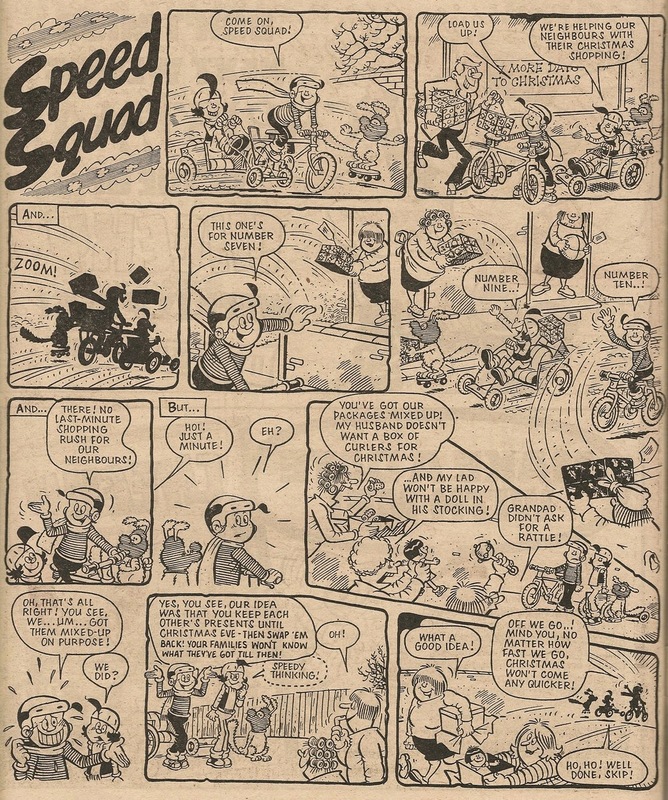 ...I reckon the above is by Jimmy Hansen - note the face in panel 8; not a Mike Lacey expression..
..the women in this Speed Squad strip seem to be variations on a theme of Ma Bumpkin so I'm going for Jimmy Hansen again. I'd welcome any comments about my re-identification, whether you agree with my conclusions or not, before I go ahead and update the blog (and then go on to look at the remaining work I have attributed to Mike). Cheers!